Change is good for the soul as they say. Good is certainly a matter of perspective, especially when we are talking about medical issues that result in a major change in the food we eat. Both my husband and my youngest were advised to remove artificial dyes, additives, preservatives and chemicals from the food they eat. In short, it means if you can’t pronounce it, then they shouldn’t eat it. Add to this that the youngest also will not eat meat unless it is ground and hidden in something and even then he may pick some out(That is the sensory processing disorder, it is a texture thing.) and the older kids are pretty sure that cooking veggies is a crime against humanity in which a war tribunal should be constructed to execute a swift and severe punishment. Well that leaves us with organic PB & J’s for the rest of forever because I am not about to make three different dinners for five people. Before I completely threw in the towel and bought a year’s worth of mason jars for making jam, I went to the internet. We live in a golden age of information and misinformation where food is concerned. I could spend the rest of an eternity fact checking and cross referencing the articles available on this kind of thing. One alternative that kept popping up was quinoa. Quinoa is a super versatile grain that is a cross between pasta and rice with a slight nutty flavor. Quinoa is also a big dietary component of those who are gluten free. Many recipes I found consist of other gluten free, dairy free, vegan friendly ingredients. Thankfully the restrictions I am working with aren’t quite as limiting. There was some tweaking involved when we started this new adventure. New textures and dishes have a tendency to fly like a lead balloon around here if I am not careful, but I felt like it was worth a chance. Quinoa has many healthy characteristics and leads itself to a great side dish. I started out with quinoa mac and cheese. Cheese makes everything better doesn’t it? Start out by cooking the quinoa according to the package directions. Some need to be rinsed before cooking, much like wild rice. 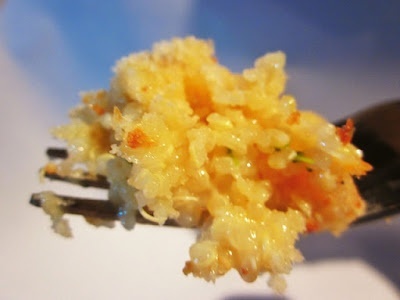 Once it is cooked, combine the cooked quinoa, 2 cloves of garlic minced, 2 large eggs, 1 cup of milk and 1 ½ cups of cheddar cheese(More if you would like to sprinkle some on top), and a dash of salt and pepper. Combine until all the ingredients are incorporated and bake in a 9×13 pan at 350 for 30/35 minutes. Serve immediately and be sure not to overcook this dish as the quinoa continues to soak up the extra moisture and you will lose all that creamy goodness. If you like, you can add steamed veggies before baking or top with panko bread crumbs and/or crumbled bacon for some extra crunch. Even our youngest was willing to try a few bites so all in all it was a win-win. Stay tuned for the next installment of Adventures in Quinoa. This entry was posted in Good Eats, Good Eats, Pasta and tagged in pasta, Quinoa, Recipes.